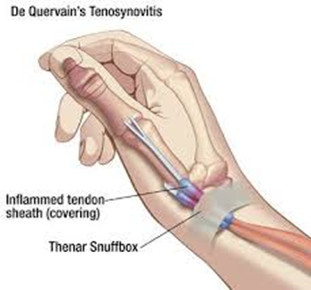 DeQuervains tenosynovitis (tendonitis) is an inflammation of 2 tendons that are responsible for thumb movement. This condition causes pain on the thumb side of the wrist and is worse with movement of the thumb. Activities such as lifting young children, turning door knobs, and twisting jar lids can be difficult. Symptoms of deQuervains arise from irritation of the tendons that extend the thumb. The tendons travel through a snug tunnel or surrounding sheath at the level of the wrist. These tendons become swollen and irritated which provoke the symptoms of pain that travels into the thumb. You may even notice swelling or a “bump” in this area that is painful to touch. The specific cause is unknown; however there may be a genetic component as certain people have many related problems such as trigger fingers or carpal tunnel syndrome. Other factors include an association with conditions such as diabetes or thyroid disease, and another considered cause is related to repetitive motion involving the thumb such as found with caregivers of young children due to repetitive lifting of the child. In more advanced cases or those that don’t respond to conservative measures may require surgery to release the tight compartment. A hand surgeon will be able to establish a diagnosis and help you to develop the best course of treatment. The most important advice is to avoid overuse and repetitive motions of your wrist and thumb. Moving your thumb or wrist from side to side repeatedly (thumb side to little finger side) can provoke symptoms. Changing the way we do things to rely on stronger, more capable muscles to do a job is helpful.